An encore post because everyone needs a fancy hat and a Mint Julep! Tomorrow is Derby Day. 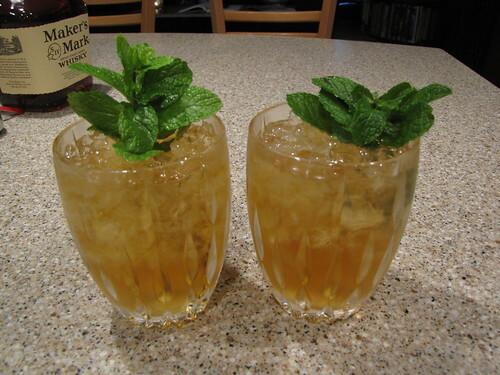 Do you know how to make a Mint Julep? Those of you who have known me for any amount of time will know that bourbon is my drink of choice. In fact, it’s a family thing. I am primarily a bourbon on the rocks kinda girl. No mixers, please. No water. And don’t even think of coming near my bourbon with coke. Shudder. However, once or twice a year, I like to enjoy a Mint Julep. 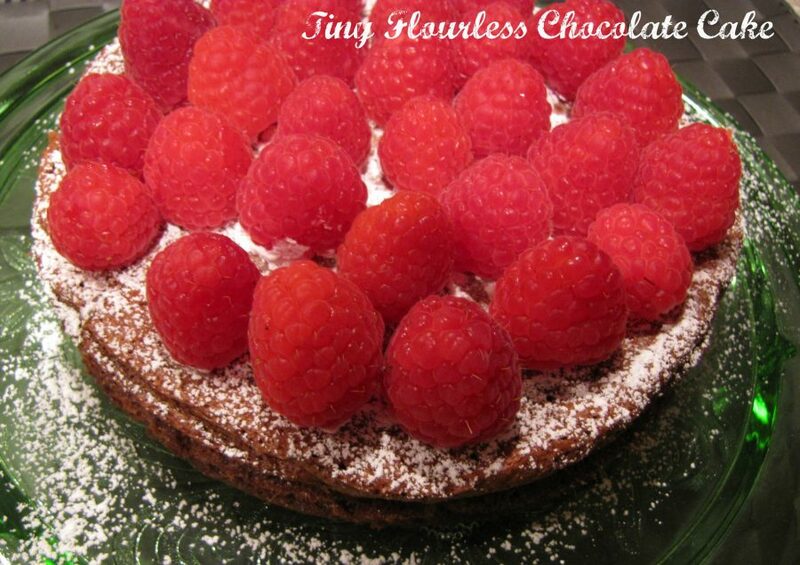 They are lovely and light and, made correctly, not too sweet. 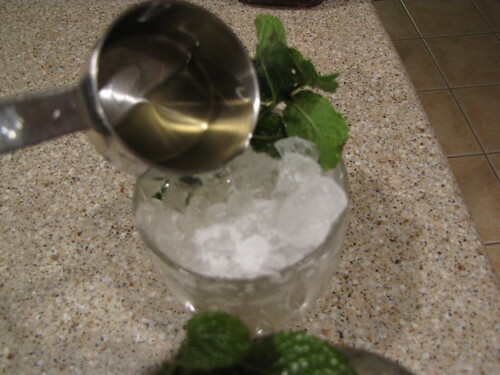 Bourbon!, Fresh Mint, Simple Syrup (Sugar, Water & Mint shown below), & Crushed Ice. 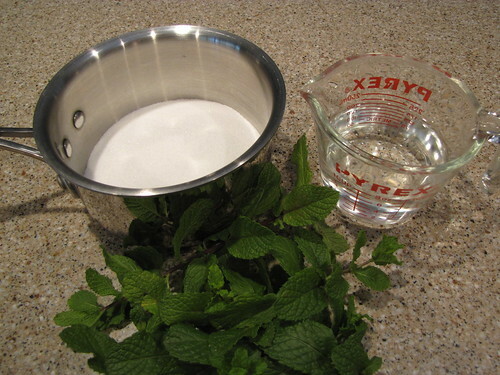 Plan ahead – this minty syrup needs to cool completely! The key to a good Julep is to infuse your simple syrup with mint leaves. 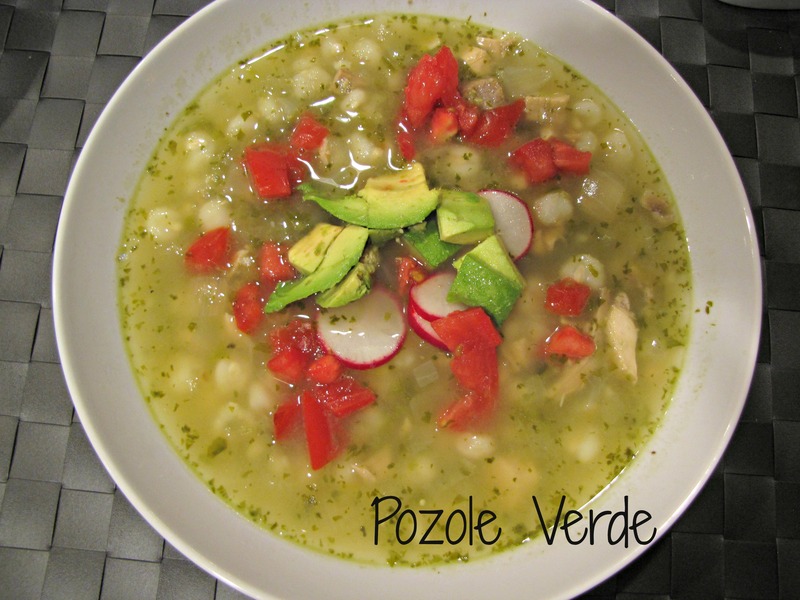 You’ll need equal parts sugar and water and lots of fresh mint. 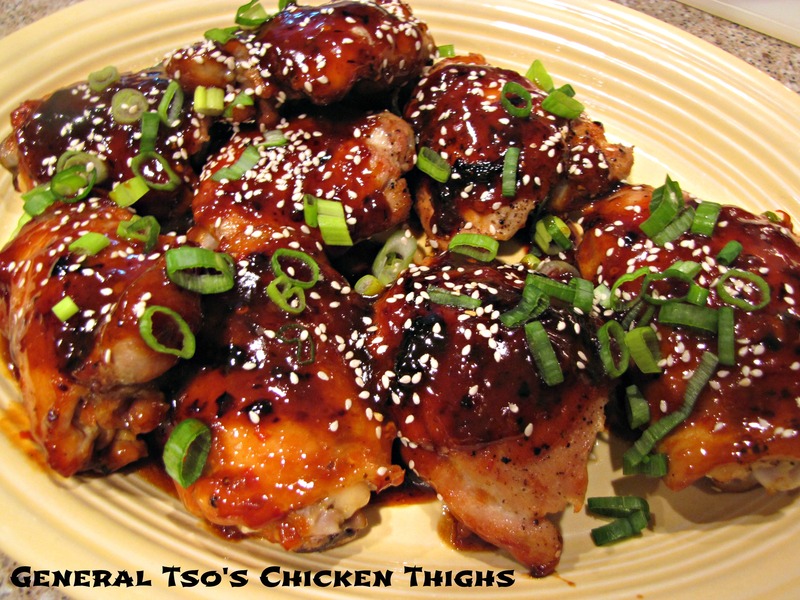 Place 1 cup of sugar and 1 cup of water in a small sauce pan over medium high heat. 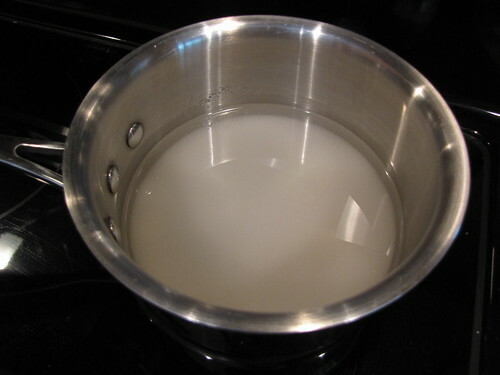 Bring it to a boil and stir it until it is clear and all of the sugar has dissolved. 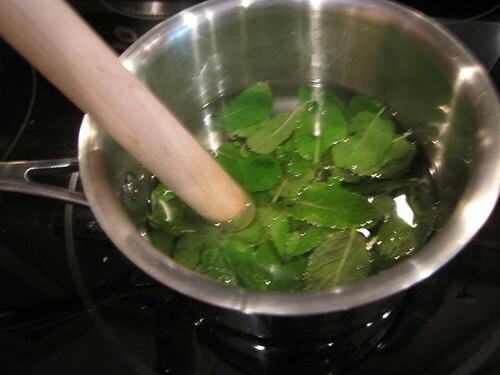 Once it comes to a boil, take it off the heat and add a big bunch of mint leaves that have been stripped off the stem. I have about 1/2 cup of leaves here. Use a muddling tool or the handle of a wooden spoon to gently crush the leaves together – this helps release the minty oils. You need to do this step a few hours before you want to enjoy your julep as the syrup needs to infuse and also cool. 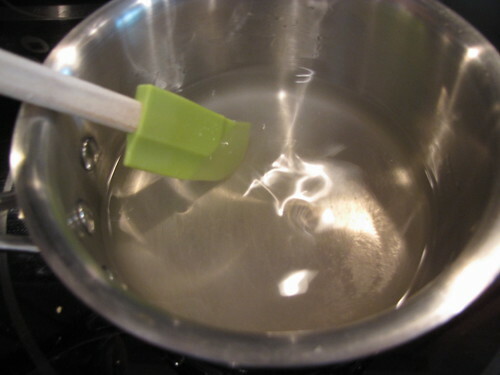 Put a lid on the syrup (and if you’re short on time, put it in the refrigerator) and let it steep for a few hours. 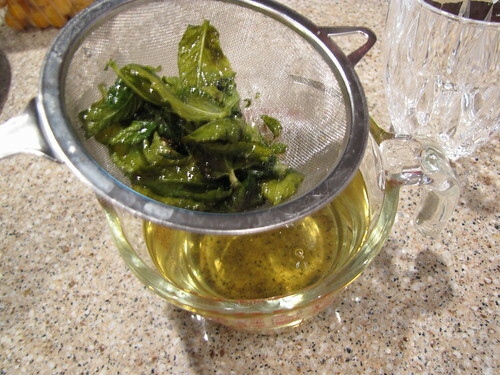 In a pinch, if you don’t have time to make simple syrup infused with mint, you can also muddle fresh mint leaves in the bottom of a glass with a spoonful of sugar. Having had juleps made both ways, I’d be remiss to not tell you that they are SO much better made with the minty syrup. When you’re ready for a cocktail, strain the mint leaves out of the syrup. Grab a fancy glass (sorry Julep purists but I don’t own silver goblets) and fill it with crushed ice. and then filled the glass up the rest of the way with bourbon. You might need a little more or less of either ingredient depending on the strength of your syrup and also how sweet/strong you like your drinks. 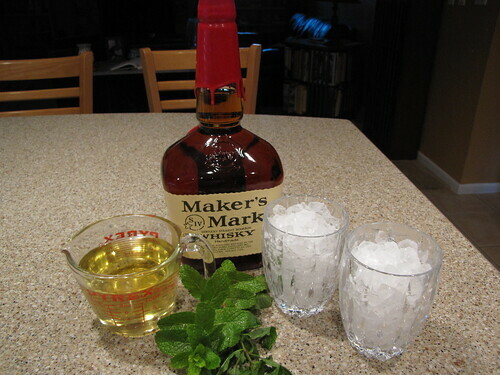 Stir the Mint Julep in the glass until it is icy cold and then garnish with a big spring of fresh mint. 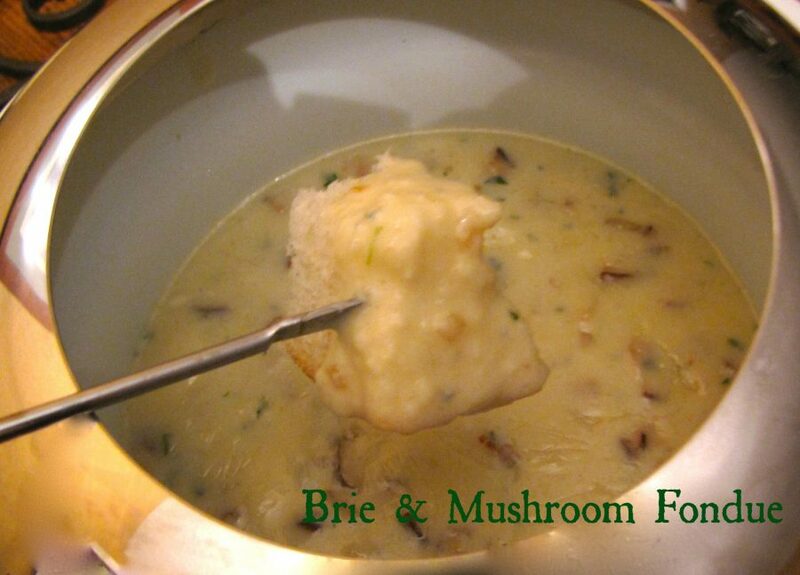 Whip up a couple of these tomorrow and then go watch the pretty horses in the Derby. Hello Bob. Would you like to join me for a julep? 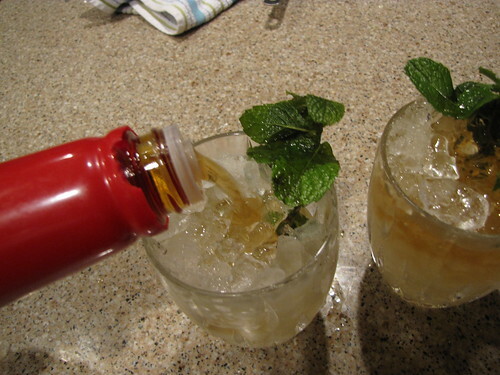 Mint Juleps. I do declare, they are lovely. Well, that certainly is a beautiful horse! And Bob is quite handsome too! But these Mint Juleps, I think I could only handle maybe one. Too sweet! Happy Derby Day!